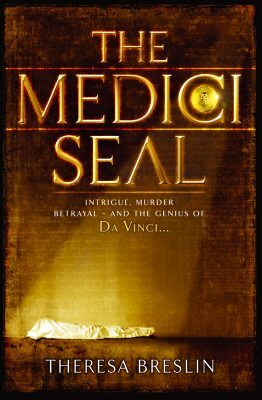 Matteo is in a very bad way when Leonardo da Vinci and his two companions pull him half downed and badly bruised from the river. What the men don’t know is that the boy was pushed into the river by Sandino, a ruthless brigand who wants something that Matteo is carrying on his person. Matteo knows that the seal he carries is important to someone but he cannot be sure who that someone is and until he can find out more, Matteo hopes he will be able to outrun Sandino. Luckily for Matteo Leonardo da Vinci, the Maestro, is happy to take Matteo with him on his travels. After a while Matteo is so familiar with the Maestro’s ways that he is an invaluable servant to the man. So Matteo goes with his new master as da Vinci creates plans to fortify the castles and forts ruled over by the much feared Cesare Borgia. Borgia is a terrifying man and both Matteo and da Vinci know that their lives are in danger as long as they stay with the cruel war lord but for a while at least they follow Borgia’s orders. Eventually they are able to leave the service of the war lord and Matteo joins da Vinci in Florence. Unfortunately for Matteo and for those around him, Sandino and his mysterious master is not far behind. In this thrilling piece of historical fiction Theresa Breslin beautifully paints a picture of what it might have been like to live in Italy in the early 1500’s. Readers will get a sense of Leonrado da Vinci’s considerable genius and appreciate that the painter, sculptor, inventor and scientist lived in a very difficult and dangerous time. Perfectly paced and full of surprising twists and turns in the plot, this is book which will have readers sitting on the edge of their seats right to the very last page.